King Zøg: I had them make brunch for us. All your favorites: poached dodo eggs, unicorn bacon and waffles. Queen Dagmar: How thoughtful, but Bean and I are going riding. King Zøg: Okay. Be safe, darling. Wub you, snuggums! Warning! 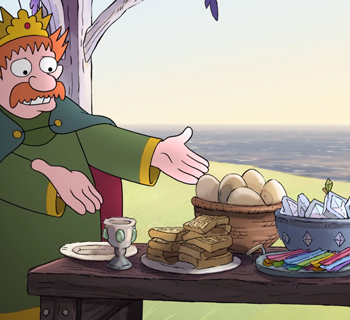 This recipe about King Zøg’s Brunch comes from episode 10 of Disenchantment season 1. However, I’ve said almost nothing about WHAT actually happens in that episode so…if I do spoil something for you – I’m sorry but, also, you’ve been warned. Disenchantment is set in a cartoon world reminiscent of both The Simpsons and (especially) Futurama, for obvious reasons. It subverts many of the standard fantasy tropes, however, I will save my in-depth review of the show for another blog post. Today we’re talking Disenchantment brunch! 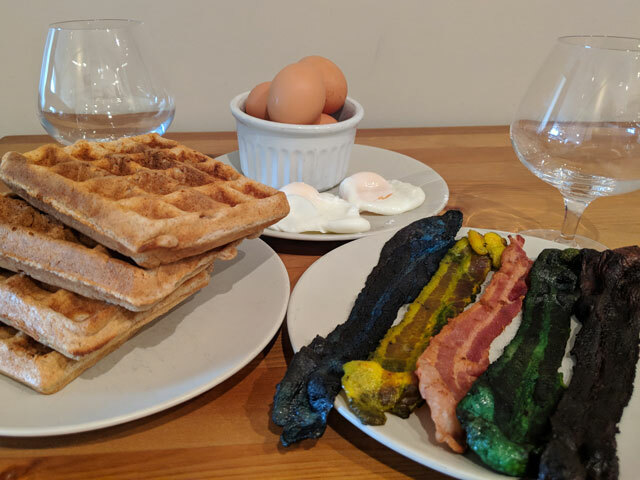 On the menu: poached dodo eggs, unicorn bacon, and waffles. The eggs and waffles seem pretty straightforward, but what to do about the unicorn bacon? …wait, dodos are extinct!? When did this happen? How did this happen? Oh wait, it was human wasn’t it? Humans killed them all, ok that actually makes sense. Well, I guess I’ll just use regular chicken eggs (chickens are still alive right?) and hope for the best. 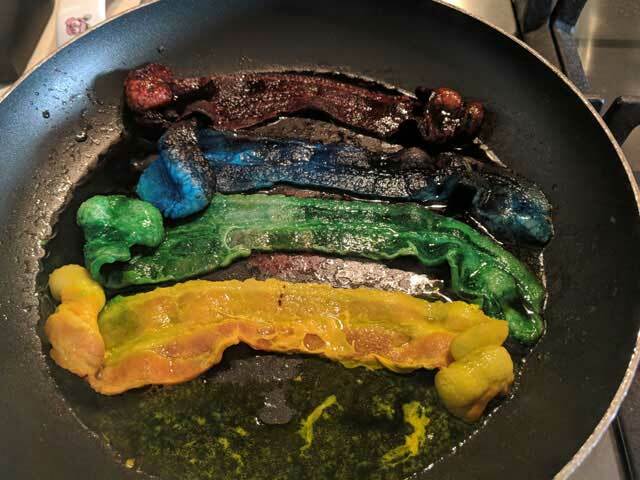 Use a LOT of food coloring to dye various strips of bacon different colors (blue, green, yellow, purple). Cook the bacon long enough so it isn’t raw but not so much that the color starts to bleed into each piece. Poach “dodo” eggs in gently simmering water (with small amount of vinegar) for 3 minutes. Make waffle batter (your choice on that!) and use a waffle iron that is hopefully still functional. Overall, I’m pretty happy with how the unicorn bacon turned out! It was touch and go in the frying pan for a few minutes when I thought everyone would just turn a gross shade of blue-ish grey, but I managed to pull everything together in time. I’m equally happy with the waffles but, quite frankly, I shouldn’t have that much trouble making waffles. I was less successful poaching the eggs into the weird diamond shape they appeared to be based on the Disenchantment screenshot. Look, poaching eggs is already kind of tricky, I don’t need to be molding these things into intricate designs when I’m already destroying bacon by dyeing it blue! Red Mocho Kooler – The Venture Bros. I also think King Zog would thoroughly enjoy a patented space age out of this world moon waffle. 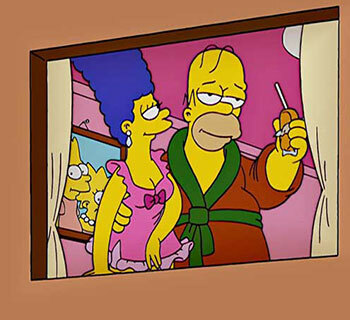 That’s what I thought too…but I’m pretty knowledgeable about The Simpsons and Futurama and nothing comes to mind. Zog would be ALL OVER some Moon Waffles though. Good work with the bacon. Also from the look of it the diamond shaped things they don’t appear to be the poached eggs but rather some form of gem fruit. See the stem and leaf on the one on the right. While on the subject I may as well ask. How is Disenchantment and did you like it? I like it ok, I think it will need some time to grow on me. I’m currently re-watching the first season before I write a comprehensive review. The animation is fantastic, but my big issues are around the sound quality feeling off and the Bean / Elfo “romance” seriously freaks me out.